Not all travel is glamorous. There is the getting to the destination, and basic sustenance part to go through sometimes, which can’t always involve charming wine to match the food – but in France they really do try in anyplace! We stopped along our autoroute between Aix en Provence and Avignon for lunch. The French autoroutes are 6 lanes highways, with the general speed ranging from 110km/hr to 150km/hr, and are toll roads but affordable and efficient. The rest stops are so well designed, are nearly a pleasure, with the gas prices advertised well in advance, and signs indicating which brand of restaurants/gas station you may encounter. The stations are really snack-friendly: deluxe sandwiches, cheese selections, fresh fruit, pastries~ plenty more than just Twinkies and beef jerky. We enjoyed sampling odd signature French potato chips, including Roast Turkey with Thyme. We stopped at one station that had a full buffeteria style diner with salad bar, fruit bar, dairy bar, and of course, more pastries. But hungry and in road-travel mode, I opted for the burger. While it was cooking, I observed the vast rows of half bottles of wine from the area that you could have with your meal. I think I was getting spoiled by our suppliers, and didn’t desire to choose a gas-stop wine to go with my lunch. Sitting down with my food, to my surprise my burger was essentially raw. Cam indicated that they tend to do that in France. So “when in Rome” I tried my best to get the taste of French beef. Half way through, I realised sometimes being a tourist means you don’t have to conform, and I just finished my yogurt instead. Other than that, the autoroutes are great! The next four days were to be dedicated to the Laurus Wine Class, which Sandra and I were to attend. A pit stop on the way was first though to the town of Tain L’Hermitage, home of the famous Hermitage appellation in the northern Rhone region. 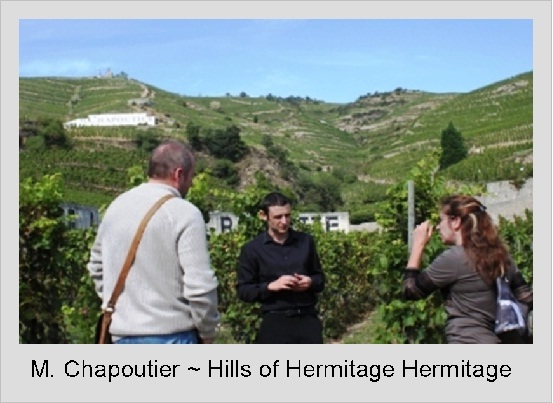 Hermitage has, like Burgundy, some very small parcels with very expensive and prestigious wines. Our stop was at a larger producer in the area, M. Chapoutier. We were guided briefly though the vineyards quite literally still within the town limits, at the foot of the Hermitage hill. The very steep slopes are at constant threat of erosion, and are terraced, preventing any mechanized work. Chapoutier has been in business since 1808, and provides a wide range of over 36 wines from France, as well as now producing around the world. Recently they provide biodynamic selections. 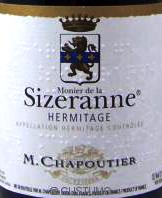 Theirs labels are also known for being legible in Braille, after Maurice Monier de La Sizeranne, owner of the plot of the Hermitage La Sizeranne, who is the inventor of the first version of abbreviated Braille. The name of Hermitage probably first appeared in the XVIIth Century in memory of Henry Gaspard, a knight from Stérimberg , who having come back from the Crusades , lived as a hermit on a hillside. The little churchlike building is still on the hill above and has become a symbol of the appellation. Among the tasting line-up, my favourite white was the Condrieu, which is 100% Viognier. Viognier is an aromatic white with a bouquet of apricots and violets, and has great depth and viscosity, perfect for Asian dishes and heavier fish dishes such as salmon. We are also able to sample two roses, one of them from Tavel, which an appellation in the region that exclusively produces dry rose wines. Fresh and crisp and delicious! Among the red, the Sizeranne 2007 was one of my favourites, 100% syrah, thick and powerful with dark fruit and gamey flavours. 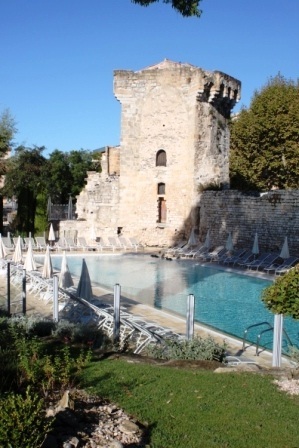 With that brief interlude in the northern Rhone, Cam took us back south for our stay at Le Cloitre Saint-Louis, in the heart of Avignon. You may recognise Avignon for two things: the “Sur le Pont D’Avignon” song that stuck in my head the whole time I was there; and the Palais des Papes, the Papal palace built in 1335 century during the Catholic Great Schism. Surprisingly, the pont D’Avignon is the Pont Saint-Bénézet, which was constantly under construction over centuries, and to this day only reaches out across half of the swift Rhone river. 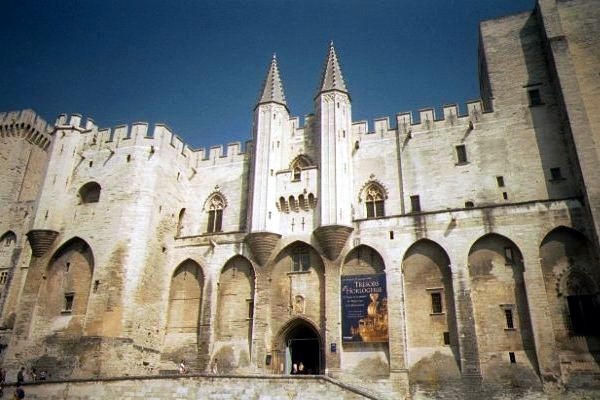 With Pope Clement V, Avignon became the home of the antipopes in the 14th and 15th centuries, and the whole town is fortified with huge walls and only a few “portes” to gain entrance to the heart of the city. Avignon’s old centre is also a great walking city, with broad avenues and bustling open places, with patio cafes and plenty of shopping . In the older quarter, another good example of ancient Roman origins, are the narrow winding mazes of streets in cobblestone, dotted with medieval architecture. The Palace of the Popes, a fortress built out of a natural rock outcrop, is now a Unesco world heritage site. Our hotel is converted from a Jesuit seminary from the XVIth centrury, with thick walled simple rooms whose windows open to a peaceful courtyard with the plantain trees and a large fountain. This is a hotel that is elegantly decorated but kept plain with monastic restraint. It boasts internet access, but I think the thick construction of walls 6 or more feet deep prevent a very good connection. Otherwise the breakfast buffet is plentiful, the beds are comfortable and the room decor is modern and chic. We are greeted in our room with a gift from the Laurus group, a corkscrew, and two-bottle wine gift pack! A lovely welcome! Greeted in the lobby by our hosts from Laurus, Anthony and Karine, we met the other Laurus class goers. I have to admit before joining this group, I had given no thought to who else might be attending the course, and I discovered we had quite a range of classmates from the wine industry. From other retailers, to wine agency representatives, to importers and distributor, as well as professional sommeliers, we had an international crew of a dozen wine lovers. We were taken on a night-time stroll through the old part of the city to a cozy little bistro called La Cuisine D’Olivier. We were served a lovely multi course meal alongside the introduction to Laurus wines. I practiced my French with the Laurus associates, which always gets better with wine! And the tradition of a four hour supper did not fall short with this group either, finishing with coffee and dessert. We were then walked back to the hotel for a good night’s sleep, for a busy day was ahead of us! Settled into Aix-in Provence for one night, we enjoyed the lovely Aquabella hotel, which is a spa-hotel built on an ancient Roman bath site. The atmosphere of the hotel is very serene, with a beautiful asian-influenced garden and lobby. The hotel offers breakfast in the Orangerie restaurant on the property, which is in a separate rounded glass building in the garden. They have a full breakfast, and of course no French buffet is complete without the array of baguettes, croissants and other baked goods. With evidence of ancient Roman history everywhere, the city of Aix makes for scenic strolling in the heart of town – plenty of piazzas and fountains, with its public spaces seeming a lot like a mini-Rome. Aix is a vibrant university city, with plenty of interesting nightspots and shopping. Beautiful as it is, we are to enjoy it only briefly, since no vines grow in the city! Our hosts for the next two days are Robert and Oliver from Marrenon wine co-operative, a large group producing wines in the AOC Luberon and AOC Ventoux wine regions. Robert and Oliver picked us up from the hotel and off we went to tour the entire two wine regions – all in one day. 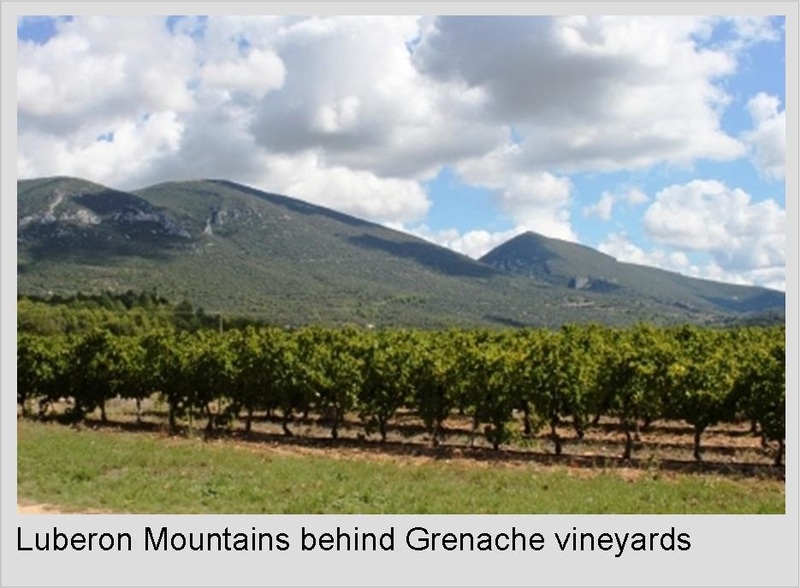 This is no easy feat – the two regions have the Luberon mountain range as its backbone that forms a sort of climate wall, a boundary between the warm and dry Mediterranean climate of the south and the cooler alpine influence on the north. 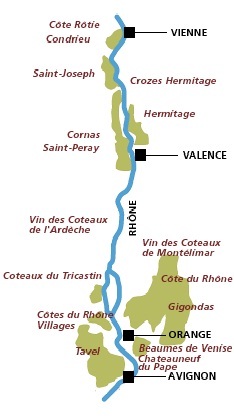 To the south of the mountain is the AOC Côtes de Luberon and to the north, the AOC Côtes de Ventoux. We shall find out what differences the wine has from each region! So up through the spiralling mountain roads we go. Our entrance point to the region was the D543 road, crossing the Durance river. 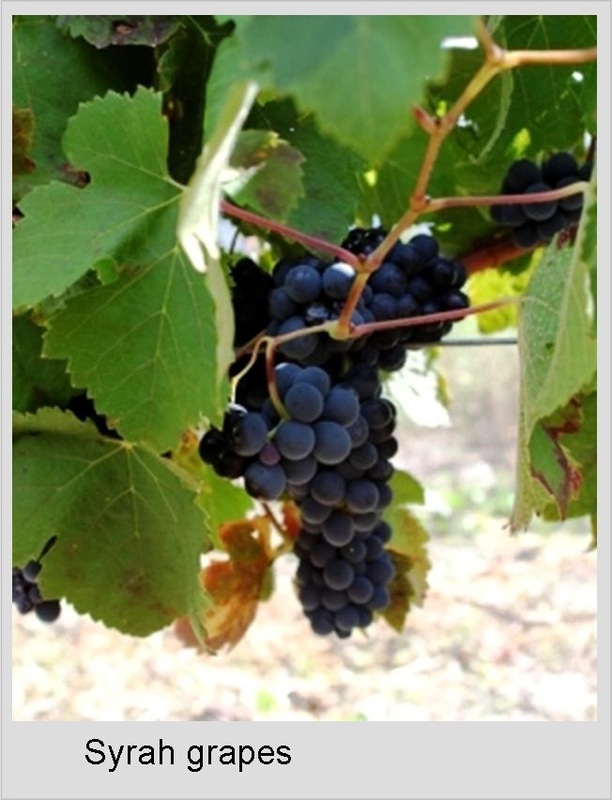 The grapes from the region for red wines are 90% Grenache and Syrah, and in general give lush, fruity, dense wines with blackcurrant and spice flavours. 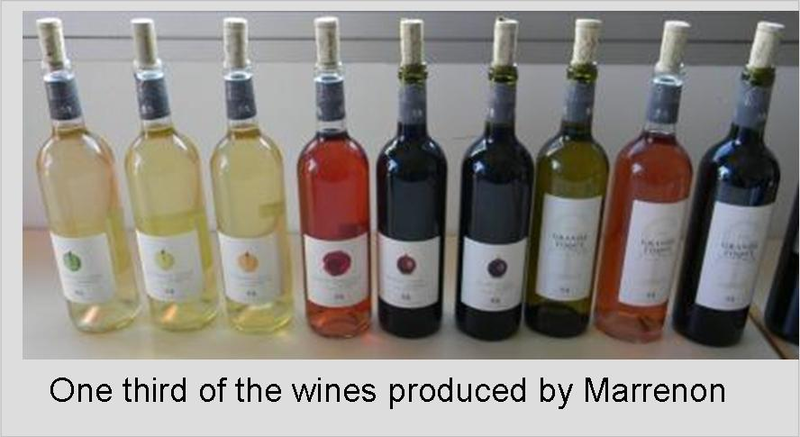 For the whites Vermentino, Grenache blanc, Ugni blanc, Roussanne, Clairette, and Viognier make up the AOC white wines, which are produced in a wide range of dry styles. Our first stop is one of several Marrenon wineries, this one in the town of Apt. Here we see in the morning the arrival of the start of harvest: red grapes being brought by truck while the air is coolest. By rule, growers cannot bring fruit after 10:30am to the winery, or it gets too hot for the grapes. 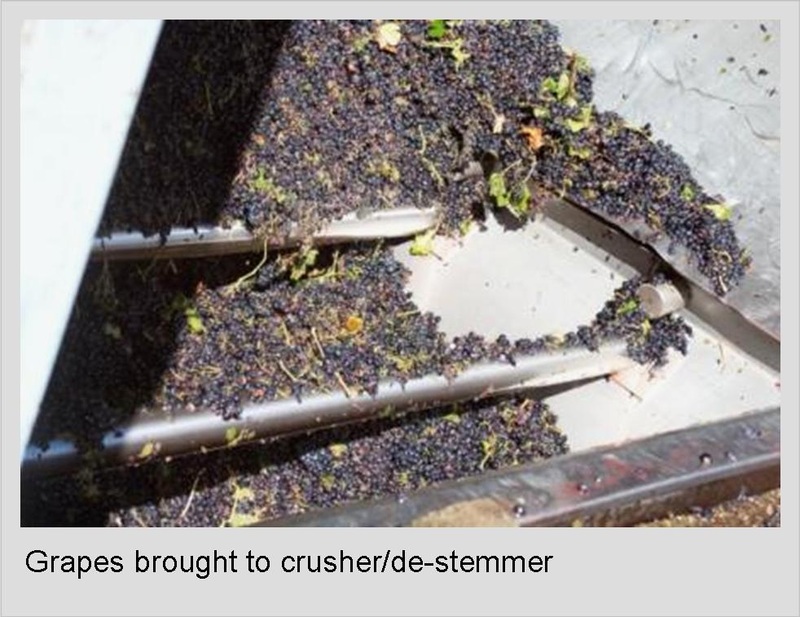 In most locations, harvest is done by machine, but in the older vineyards (one of their old vines Grenache vineyards is 103 years old! ), harvest is done by hand. 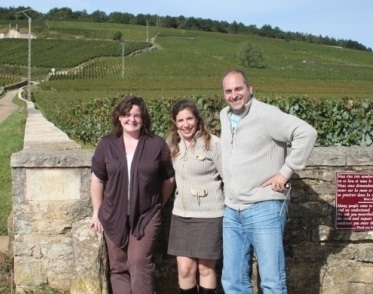 We met with winemaker Genevieve, who took us on a tour that followed the arriving grapes and their juice-to-wine path. After lunch we packed back into the car for a twisty ride. The countryside is stunning, and we paused at several points to get a panoramic overview of the region. Dotted with vineyards, olive trees, cherry trees and lavender fields, the patchwork valleys between the mountains show a rural farming life around the bounty of the Luberon. Small hill towns are nestled at varying heights, showing off either ancient forts, Romanesque churches or commanding views. 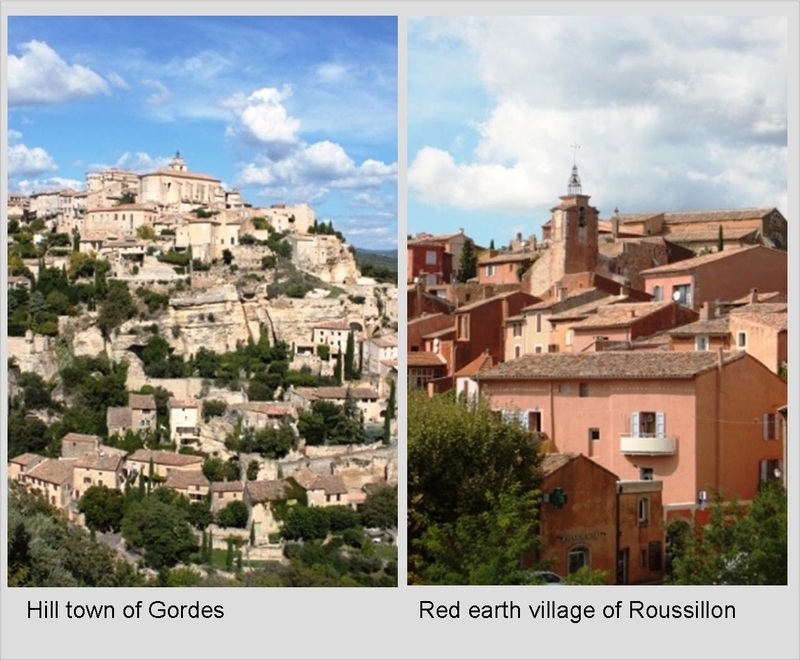 Two beautiful stops we made were at Roussillon and at Gordes. Roussillon is famous for its red-ochre earth, which was used for dyes and paints. Now it seems to be quite the artists’ pilgrimage spot. And at Gordes, it is an incredible example of hillside towns being build out of the rock faces. Plenty of tour buses here, despite the very narrow streets! Robert managed to show off his would-be-Formula-One driving by getting us around to all the hill towns and hair-pin turns in one day. Made for a very exciting adventure! A final stop at the main Marrenon winery in Tour D’Aigues showed us a top notch facility and bottling line. 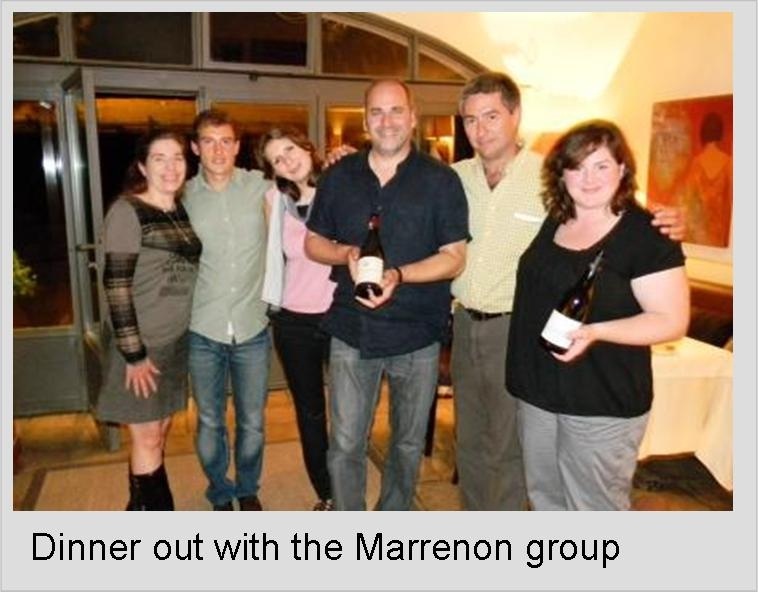 And of course, this was followed by a full Marrenon portfolio tasting! 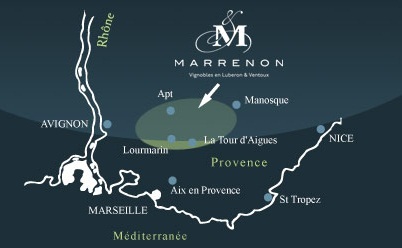 We are happy to now know so much more about the wines from this region~ since Cam, Sandra and I are among the few to visit Marrenon from all of western Canada, we are almost Luberon/Ventoux experts! Dinner in Tour D’Aigues was at an art-decorated bistro. The menu was simple but very classy, each fixed menu offering a sample of regional traditional foods. Perusing the menu, I said in my amateur French “I didn’t realise that wolf was a common dish around these parts,” since Loup was on the menu, which is French for wolf. Our hosts could not resist bursting out in laughter, since the menu was actually referring to a specific fish of Provence, Loup. Good thing I asked! I opted instead for the rack of lamb. 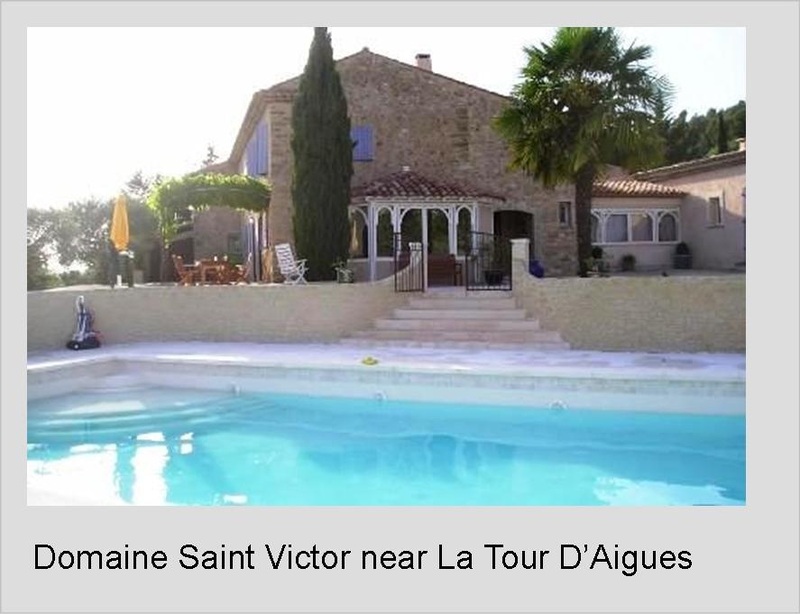 After a long day of travel and wine, we were happy to rest at the Domaine Saint Victor, a rural guest house that would make a fantastic get-away if we had another week! The plan for the day was to burn in our minds the country side and echelon of appellations in the Cote de Nuits and Cotes de Beaune. As though simply designed for the tourist in mind, almost all the Grand Cru and Premier Cru vineyards run along the west side of rural highway D974, with the lesser Bougogne wines on the east side of the road. 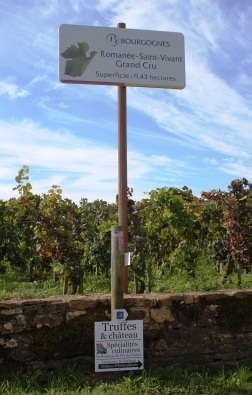 I took a photo-diary of each appellation we passed by, well sign-posted, as we drove in and out of infamous vineyards. France has excellent road signage to start with, but in wine regions, just about every wine estate is well advertised with road signs. A ride up the centre of the valley, we took a photo op in Aloxe-Corton at Chateau de Corton-André, the famous yellow and black patterned rooftop on the 18th century chateau. We got wine-geeky and made a necessary photo-stop at La Romanée-Conti. This is the most elusive and expensive wine from the Burgundy region, and the little red sign accordingly requests that you don’t hop the rock wall to pick the grapes! We drove our way out of Burgundy, along the patchwork hillsides and picturesque little towns ~on to the Rhone valley for the next week! Searching for a lunch spot at Tounus, a small fortified town alongside the River Saône, we visited a fortress-like Romanesque church from the 10th century. A sacred place since Roman times, the location has a unique history of housing two monastic communities including the Abbey of St. Valerian and the monastery of St. Philibert. I love strolling through old churches in Europe – it is always a chance to quietly walk through time back to a simple life, even when there is a bustling city outside. 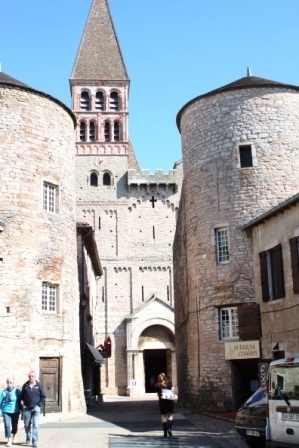 In Tornus, the Romanesque architecture, the solid cold stone construction, the ancient mosaics and the half erased wall frescoes are a classic example of small-town France religious history surviving time. Coming from a young country like Canada, I wonder if the locals think it really special to go to church in a place like this every Sunday! From that historic interlude, we were off again to make our way to Luberon country. We will be meeting with business partners from the Marrenon Wine Co-operative and seeing how wine life may vary there from Burgundy. We wandered into Beaune for lunch, to enjoy the jazz festival echoing through the street, and grabbed a patio seat at Le Galion for some beef tatare, beef bourguinon and pottage aux legumes, paired with a nice fruity rosé wine from the region. The view across from the bistro was Chapelle St. Etienne, a small 17th century church, in which we discovered a wine tasting display. 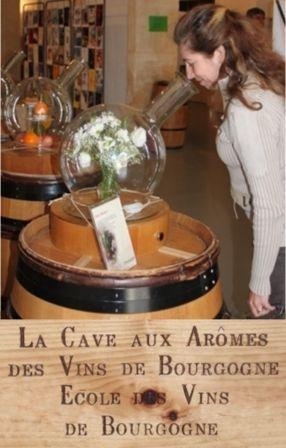 The various characteristic aromas and flavours of white and red Bugundian wines were isolated in to giant “nose bowls”. Bowl after bowl helped clarify with our noses what our tastebuds had been already experiencing! Beaune’s old centre is a tourist heaven, offering plenty of shops with local goods over and above wine – mustard from Dijon, Crème de Cassis liqueur, macaroons (very different than the chocolate and coconut macaroons in Canada) and other dessert delights, perfectly sculpted terrines, cheeses and pastries just to start. 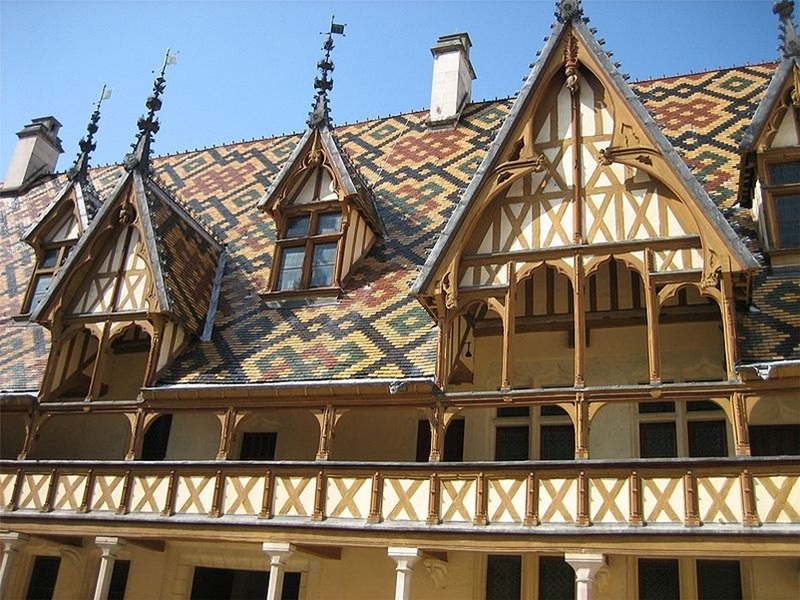 Beaune is very active culturally, with music and arts festivals. During the evening, “flickr” art, essentially light shows, are projected on the historical monuments and light up the evening streets for the many out for casual strolls. 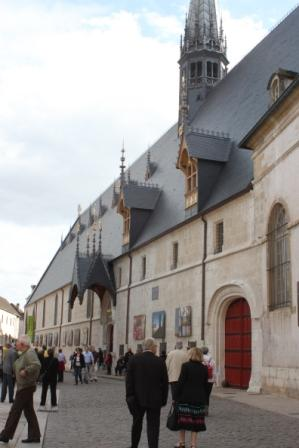 Beaune is also famous for its Hotel-Dieu, or Hospices de Beaune , which was founded in 1443 as a hospital and sanctuary for the poor. The traditional glazed-tile roof is an architectural feature of the region, known for the colourful pattern. Every year in November, a grand charity wine auction is held on site. Across from the Hospices is an amazing book store, Athenaeum, where I managed to find an excellent Burgundy wine book and some maps! And the day would not be complete without more wine-tasting. We were again in luck for a special experience in the evening, Pierre’s father Jean-Claude invited us to his personal cellar, in Mersault south of Beaune. Welcomed by Jean-Claude, as well as Pierre’s wife and their daughter Lily, we enjoyed very special vintages from the cellar that covered decades ~ 1963, 1986, 1989, 2001, 2005 among others. Oh, the hospitality of the Burgundian people! Tasting both weighty, mineral Chardonnays and some rare red Mersault, Jean-Claude was very generous in letting us glimpse decades of work, and how these wines age so gracefully over time. Tips from the day~ Best Burgundy book: “Les Vins de Bourgogne” by Sylvain Pitiot et Jean-Charles Servant ~ is published in English too, but the maps in the French version are in colour and more detailed. Our charming rest-stop for two days in the Burgundy wine region was at the Manor of Henri de Villamont in the town of Savigny-lès-Beaune. This beautiful estate is a 3 minute drive north west of Beaune, and offers both lodging, and a wine tasting room with wines for purchase. But the Cava Team is lucky, and we were joined in the morning by the winemaker, Pierre Jhean, and his sales director, Benoit for the grand tour of the properties and winery. We were immediately taken to stroll the vineyards on the Manor lands, which included Savigny-les-Beaune “Le Village” and the Premier Cru vineyard of Savigny-les-Beaune “Les Guettes”. The flatter terrain on the property belongs to “Le Village” vineyards stretching up the hill to the north, but there is a wall dividing this vineyard and its designation, from the Premier Cru designation of “Les Guettes”. This was only the start of the introduction to what the landscape is like, and its demarcations in the Burgundy region. I was beginning to think that I was going to need a really good book on the region, and a really good map! Some gunshots rang out to shake us from our leisurely stroll – Pierre’s son was off with family members to hunt wild boar ~ at this time of the year the animals can wreak havoc in the vineyards, and there is plenty of legal hunting to keep the wild boar population away from the vines! And so we were taken away on a drive through the country-side to various property holdings of Henri de Villamont – a parcel-by-parcel view of the region, one appellation at a time. This by no means took all day ~ the drive was very useful in illustrating the scale of Burgundian properties – extremely small vineyards, which in part can explain the high prices the wines can command! To really give an example of the meaning of Terroir, Pierre and Benoit took us first to two of their properties: Chambolle-Musigny 1er Cru “Les Feusselottes”, and Chambolle-Musigny 1er Cru “Les Groseilles”. The two properties are about 50 feet apart. Benoit set up our field tasting bar on a handy landmark, and then we tasted the difference 50 feet, slope and soil can make! The 2007 Feusselottes was fruity and elegant with cherry and raspberry flavours, and the 2008 Groseilles was more earthy, muscular and tannic. What a great little science experiment! After several more property views, including the entire 11 vine rows of Villamont’s Echezaux (Pierre had to double check which exact 11, they are not well marked! ), we were back to the cellar at the winery for a tour and serious tasting. The cellar was built in 1880, which is huge, holding up to 4000 barrels for aging. A prolific producer of fine wines, we tasted 10 white wines and 13 reds, all different expressions of the Chardonnay and Pinot Noir grapes from different properties. Cheers to Terroir!